LPe provided structural engineering services for this single-story 25,000 square foot steel-framed structure. The structure itself is supported by steel joists, beams and columns while lateral stability comes from moment frames. The foundation supported on shallow footings. LPe provided Structural engineering services for this three-story 20,000 square foot steel frame/wood frame structure with brick facade. Lateral stability is provided by steel X-bracing while the foundation is supported on shallow footings. LPe provided Structural engineering services for this single story 7,000 square foot steel framed structure supported by steel joists, beams, and columns. Lateral stability is provided by X-bracing and moment frames while the foundation is supported on shallow footings. LPe provided structural engineering services for this two story 15,000 square foot wood framed structure supported by open web wood trusses, wood walls and shallow foundations. LPe provided structural engineering services for this three-story 30,000 square foot wood framed structure supported by wood trusses and wood walls on shallow footings. LPe provided structural engineering services for this single story 20,000 square foot steel frame structure with pre-engineered wood trusses and interior light gage metal shear walls. LPe provided structural engineering services for this single-story 15,000 square foot steel frame structure supported by steel joists, beams, columns and masonry walls. 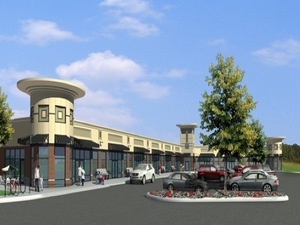 The foundation of the retail center is supported on shallow footings.